Pneumatic operation for dependable, long-cycle operation and maximum efficiency. It saves employees fingers! For Teflon, see Model 685H, page 6. For silicone or latex, see Model 875BC, page 3. Unit is supplied with a non-marring base and foot pedal with regulator and gauge. Note: You have approximately 3 to 5 seconds to insert fitting into the tube after the foot pedal has been released. 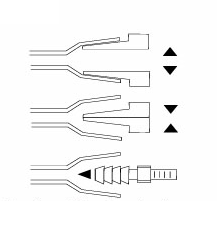 How well a tube assemble is a function of its durometer and material content. After the fitting is assembled, it may take up to 24 hours before full assembly is reached. Order by Model No. followed by jaw/cam size. 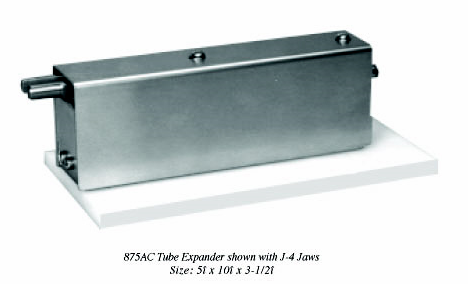 875AC with J-4 jaw and PC-4 cam- can be used with PVC or similar tubing with an I.D. of .250î will spread tubing 1/2î. Design & Developed By NetSorce Digital.